Tenerife is the largest of the Canary Islands, the landscape is dominated by Mount Teide, the 3rd tallest volcano in the world, which at 3,718m is also the highest point in Spain. Tourism started initially in Puerto de la Cruz during the late 19th century when visitors started coming to the island to improve their health in the warm climate, as well as botanists and geologists. The holiday market began in the 1960’s when the island started receiving tourists in search of a sun & sea destination. The development of the tourist resorts in the south of the island started in the 1980’s. Tenerife has two international airports, Tenerife South – airport code TFS – which was previously known as Reina Sofia Airport is the biggest and situated in the South of the island. Tenerife North – airport code TFN – which was previously known as Los Rodeos Airport is situated at a height just over 600m from sea level at San Cristóbal de La Laguna and can be affected by adverse weather. Flights from UK are usually scheduled to TFS. The cruise port in Santa Cruz de Tenerife attracts over 4 million cruise visitors a year. As well as the inter island car ferries from Lanzarote, Fuerteventura and Gran Canaria. Los Cristianos harbour in the South of Tenerife connects with San Sebastián & Valle Gran Rey in La Gomera, Valverde in El Hierro and Santa Cruz in La Palma. Costa Adeje is the luxury resort of Tenerife with upmarket villas and 5* hotels. The fabulous Siam Park will keep children and adults entertained, it’s one of the best water parks to be found in Europe. Playa del Duque, Playa Fañabe and Playa Paraiso offer a variety of beaches to chill out on and soak up the sunshine. The surf crowd flock to El Médano on the South-East coast which has the best natural beaches on the island. Families also love the laid back vibe of this resort and short transfer from Tenerife South Airport. 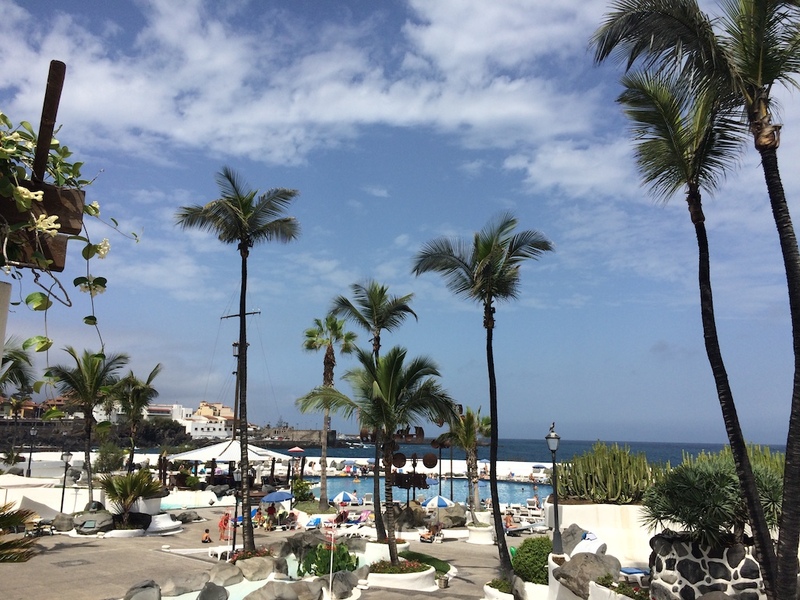 Los Cristianos is next to Playa de las Américas, it’s a harbour town with beaches and attracts a more mature crowd, as well as those looking to take boat trips to La Palma, El Hierro and La Gomera. Dwarfed by the 300m high cliffs, the town of Los Gigantes on the West coast with a marina and small black beach is proving a popular alternative to the big resorts in the South. Playa de las Américas is the main holiday resort on the South coast, it was purpose built and attracts the British crowd seeking beach holidays with a vibrant nightlife. Puerto de la Cruz was the original tourist resort in Tenerife situated on the North coast. The beaches are black in this area, and the seafront is dominated by the Lago Martiánez salt water swimming pool area created by César Manrique. Puerto de la Cruz is also home to Loro Parque which boasts to be the best zoo in the world. We can’t forget the capital city of Santa Cruz, there’s a fabulous beach waiting to be discovered at Playa de las Terrasitas, lined with chiringuito beach bars and shade from the palms. Combine this with great shopping and gastronomy for a city & beach break. The university town of San Cristóbal de La Laguna, by Tenerife North airport was declared a World Heritage Site by UNESCO in 1999 and offers an interesting alternative to a beach resort in Tenerife. This historic city is the old capital of Tenerife, and known as the cultural capital of the islands. Enjoy strolling the picturesque pedestrian streets and sampling a fabulous range of gastronomy. Gold del Sur started as a private resort with the development of three 9-hole golf courses and a venue for PGA tournaments. Situated close to Tenerife South Airport, this area predominantly attracts visitors planning golfing holidays. Tenerife has a large range of accommodation available. You can literally find something for everyone, ranging from very cheap and cheerful studio apartments to super luxury 5 star hotels, and the Parador at Las Cañadas in Teide National Park. Tenerife is known as the “Island of Eternal Spring” and famous for sun & beach holidays. The island is also popular with hikers attracted by the exceptional walks to be found in the Teide & Anaga National Parks.